In our last blog we hinted to a release date for Fragments of Him on PS4. 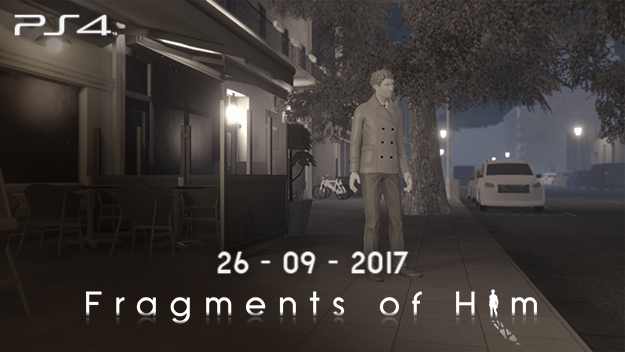 We are happy to announce that Fragments of Him will be available in the Europe and Americas region on PS4 on 26-09-2017. Updates on Sassybot developments have been scarce over the last year. This is caused by contract work that only allows us to work on Sassybot for 1 day a week. With this fraction of time available to us we managed to port Fragments of Him to PS4 and prepare for release in two major regions. Despite our constrained efforts we are happy to bring the story of Will, Sarah, Harry, and Mary to a whole new audience this year. Soon, our contract will come to an end and we will be able to spend all of our time on a new project. What this is exactly is too soon to disclose but we expect to make major strides in the months to come. If you are interested in what Fragments of Him is all about and you want to support us, please consider getting Fragments of Him on Steam, Xbox One, or PS4. Elwin and I are very excited about getting back to full-time development and will keep you informed on future developments.